Throughout the world, there are various cultures and societies that celebrate their own traditional festivals. One of the most predominant celebrations in Southern California is the Chinese New Year festival. This festival takes place on the first of the lunar calendar and originates from centuries old traditions. For a long time, China has been a predominantly agricultural society. Due to the hardships of rural life, festivals such as the Chinese New Year have served to help alleviate and enliven the daily routine of the agrarian peoples. Because the yearly success of the agricultural crops weighs heavily upon factors that are beyond the control of an individual (i.e. drought, weather, plague), the Chinese farmers wished heavily for prosperity. They believed that prosperity was a factor that could be invoked to make them successful. It was their prosperity that they wished to improve. According to Patricia Bjaaland Welch, author of Chinese New Year, Chinese New Years is a “… period of saying goodbye to the past and preparing for the future…” (Welch 4). It is the hope of these agrarian families that in preparing for the future, the coming year is filled with luck and prosperity. Chinese New Year is the celebration of this search for luck and prosperity in the forthcoming year. During the New Year festivities, traditions include giving children red envelopes filled with money, burning incense for ancestors and eating dumplings known as jiao zi. In this research paper, we will explore the transition of how a once monetary object evolved into a savory symbolic representation. The word jiao zi has a fascinating history where it has taken on different meanings throughout the centuries. The end result is a multi-definitive term which does not simply mean dumpling, but is symbolic of the way money is viewed in the Chinese culture. The history of the jiao zi dates back to the Northern Song Dynasty. During this time, merchants in Chengdu distributed one of the earliest known paper money. The currency was called ‘jiao zi.’ With the high circulation of the currency, the local government of Chengdu established the earliest administrative and savings bank known as the Office of Jiao zi (Chengdu Government). The word jiao zi then began to be used as a general term for money. In ancient China, yuan bao was used as currency before the use of jiao zi paper money. According to (Beijing Trip), jiao zi looked like shoe shaped gold and silver ingots known as yuan bao. In the Chinese culture, jiao zi are made during the New Year to resemble the gold and silver ingots. People in Henan and Sanxi provinces enjoyed boiling dumplings with noodles and serving them together. “They name the serving ‘golden threads piercing through silver ingots,’ or ‘silver threads stringing together calabash.’ Golden or silver threads mean noodles while silver ingots and calabash refer to jiao zi” (CCTV). Eating the dumplings during the New Year is a metaphor for eating money; when people eat jiao zi during the New Year celebration, they hope that it will bring prosperity and good luck for the forthcoming year. The term jiao zi has multiple meanings, one of the meanings means “midnight or the end and the beginning of time.” This is why the jiao zi are made the midnight of the last day of the passing lunar year. Another meaning of the term comes from the literal translation to “sleep together and have sons” which is a long lost good wish for a family (Salisbury). Not only does the shape of the jiao zi resemble the golden ingots, it also represents a crescent moon and symbolizes the hope for a year of plenty (Wellington). Occasionally people will add specific fillings to select dumplings in order to symbolize certain wishes. Those who receive sweets will have a sweeter life, peanuts symbolize long life, and dates and chestnuts represent the imminent arrival of a son. Because the word “dates” is homonymic with the word “early” in Chinese, so are chestnuts (zhenzi), the syllable “zi” is homonymic with children (Latsch 7). The tremendous amount of food prepared at this time was meant to symbolize abundance of wealth in the household. 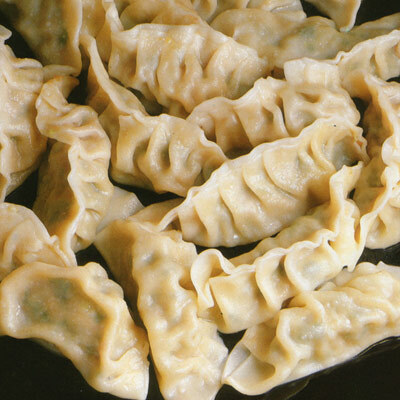 Rich families in ancient times added gold, silver, and other precious stones in their dumplings. To get one of these dumplings was considered good luck. Later this transitioned to adding coins in the dumplings. Copper coins, for example, meant that one would never lack money. In contemporary times, only a few coins were washed and add to the batch of dumplings, the person who discovers the coin would enjoy good luck and make a lot of money in the coming year. When the Chinese began immigrating to Southern California, they brought over their cultural practices in order to preserve their heritage. In an interview with a local Southern California restaurant owner, the owner shared his experiences and how he incorporates this tradition in his restaurant services. What is a yuan bao jiao zi? Yuan bao jiao zi are dumplings made in the form of ancient Chinese money. They signify money and wealth, that’s why we have the gold yuan bao statue in our restaurant so that during the new year our dumplings represent wealth for the new year. As far as I know, it is mainly practiced in Santong, China. To put money in the dumpling means whoever eats the dumpling with the coin has good luck and will be lucky in the upcoming year. Why is it practiced here in the restaurant? People nowadays are busy and don’t have time to make the dumplings on their own time. We make dumplings with seafood, vegetables, and meat. We even get calls from customers to prepare special dumplings in advance. Can you describe the first time you saw someone do this? The first time I witnessed this tradition was from my grandmother, but from what I know, it goes back many generations. Do you think you will continue this custom with future generations? I will continue this custom because it is a treasured tradition in China. The interview with the restaurant owner demonstrates how a Northern Chinese practice has been brought over and incorporated into the lives of Chinese communities in Southern California. Although in today’s fast paced society, people still find ways to sustain their customs. At the interviewed restaurant, customers would call in ahead of time to place orders for the New Year jiao zi. The service the restaurant provides shows how traditions stay the same throughout generations. In the second interview with a local Southern Californian, the individual shared their personal experiences of the New Year jiao zi. Where did you get the custom? It was brought over from Santong by my father. How do you display it during Chinese New Years? During New Years I have in my house gold ingots that represent luck and prosperity during the New Year. Why and when did you start this practice? I started the process when I got married. My husband is not Chinese, but I feel it is necessary to pass this customary tradition to my children because it is important that they are aware of their Chinese heritage. Do other cultural groups practice these customs? I am not aware of any other cultures that practice this custom. Can you tell me a little about the background of this practice? In Santong, when someone goes far away, the dumplings are made for them because when you boil the dumplings, they turn in a fashion that signifies a smooth and prosperous journey. When I was very young, my father made everything out of scratch. In my family, we used sweets such as red bean paste, sugars, dates, and chestnuts as filling for the dumplings. Are there any legends or stories associated with jiao zi? No, none that I have heard. Are there other ways that you could use jiao zi? In the olden days, we used to make an excess of dumplings to give out to our family and friends as symbols of gratitude and to symbolize wealth and prosperity. In a non monetary sense, how much would you say the jiao zi is worth to you? It is very difficult to place a value on it. The dumplings contain a cultural and sentimental value that is priceless. The importance this practice plays in teaching the children about their Chinese heritage goes without saying. After all, how can you put a value on preserving your own cultural heritage? In our society today, especially here in Southern California, we are immersed in a melting pot of different cultures. There is a need and desire within each individual to retain their own cultural identity; it is one’s own culture that plays a big role in the development of one’s own personality and self worth. Culture and heritage play a vital role in the identity of each individual. Especially among individuals of ethnic backgrounds, one’s own cultural identity is the only aspect that sets them apart from their peers. An individual’s culture plays a considerable role in the development of that individual’s moral values and perception of life, society, and family. It is only natural, that from one generation to the next, individuals lose more and more of their own cultural heritage, and in turn become more assimilated to American pop culture. Through simple cultural practices such as jiao zi, an individual can identify with their cultural heritage and retain the individuality that they desire. Practices such as jiao zi were brought over to Southern California by immigrants who were searching for new opportunities in America while trying to retain their own national identity. 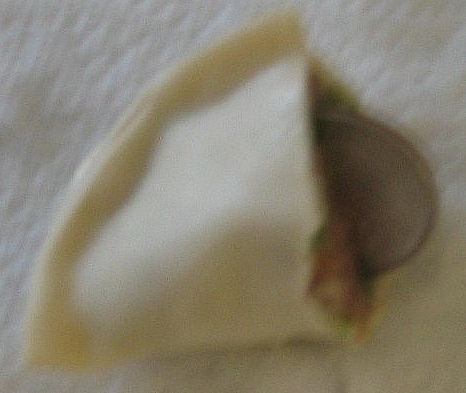 The word jiao zi has evolved from a paper currency to signify good fortune in a dumpling. It carries on the monetary wishes of the Chinese culture. In America, jiao zi is part of the traditions and rituals that followed generationally and cross-continentally because of the Chinese immigrant’s deeply rooted beliefs in them. In Southern California, the integration of jiao zi in the lives of Chinese Americans serves as a means of identifying with their culture. In an anthropological perspective, the multiple monetary representations of Chinese New Year jiao zi demonstrates how a form of ancient money has evolved from a solely monetary use to one that embodies the celebration of Chinese new year. Not only does it still retain its monetary meaning, the Chinese culture uses it more in a representative sense to signify wealth, good luck and prosperity. Latsch, Marie-Luise. Chinese Traditional Festivals. Beijing, China: New World Press, 1984. Tun, Li-Ch’en. Annual Customs and Festivals in Peking. Hong Kong: Hong Kong University Press, 1965. Welch, Patricia Bjaaland. Chinese New Year. New York, US: Oxford University Press, 1997.